A charming Ligurian country villa in a stunning location with fantastic views over the Mediterranean and the Maritime Alps. 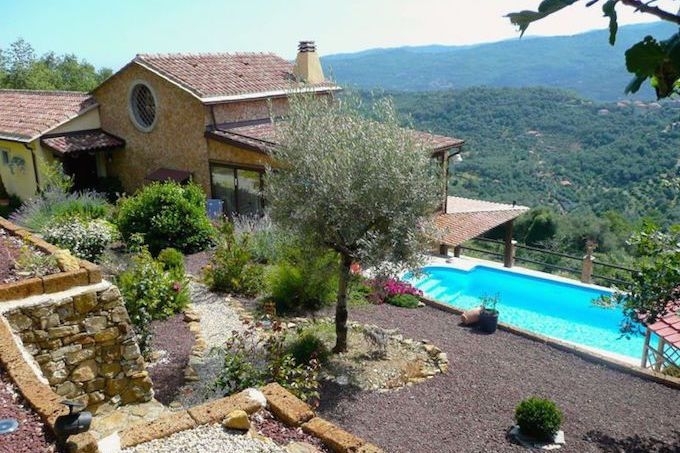 This property is in a sheltered south-west facing location above the village of Vasia, nestling among stunningly beautiful nature and looking down on one of the prettiest valleys to be found in Liguria. Vasia is a picture perfect mountain village, a 12 km drive from the coastal town of Imperia (4km as the crow flies). A small country lane, which ends right outside the property, connects the house with the village. The villa offers 322 sq.m. of living space, split over two floor levels, with all rooms and terraces enjoying stunning views over the valley, the mountains and the Mediterranean. The upper floor level measures 185 sq.m. overall and features a spacious galleried living room with open fire place. The living room opens into the fully fitted country kitchen and adjacent dining room. Following on from here is the library with another open fireplace, creating a wonderfully comfortable ambience. Further on is the large en-suite bedroom with open space bathroom, walk-in wardrobe and separate toilet. Also on this floor level is the main entrance with hall and guest toilet. Outside the living room and facing the pool area, is the attractive fully heated and insulated winter garden with large windowpanes and a stone dining table large enough to seat 14 people. The winter garden opens out to the pool terrace, with saltwater swimming pool and garden pavilion. A number of terraces and the lawn follow on from here. The ground floor measures 95 sq.m. overall and offers a studio, a guest bedroom with walk-in wardrobe, a guest living room which could also serve as a bedroom and a spacious shower room. All 3 rooms have access to a roof covered terrace. Also on this floor level are the utility room with washing machine, tumble dryer and worktop and a hall with direct access to a 44 sq.m. double garage with adjacent house technical services room. The villa was newly built in 2008 to the highest of specifications. All technical equipment is of a very high standard, featuring an alarm system with video surveillance, telephone, high-speed internet and satellite connection providing more than 1,000 TV channels. A solar system connected to a powerful hot water pump provides heating (under floor heating), hot water and supplies the pool with warm water. All electricity is provided by a 9 KW Solar-Energy-Fotovoltaik System. The surrounding 4,600 sq.m. grounds are beautifully designed and have an automated watering system, fed by a separate water tank. The many terraces, planted with mature Mediterranean shrubs, olive trees and fruit orchards, are all connected by traditionally built walls and steps. To the rear of the house is a sheltered summer kitchen with BBQ and sitting area. The 12 x 4 m swimming pool with Roman stairs is attractively embedded in the garden terraces. A Jacuzzi on the lower roof covered terrace presents yet another relaxation area. The grounds are fully fenced-in and an automatic gate opens onto the forecourt with carport. Vasia is a small village with some 400 inhabitants. It has its own post office, community office, one restaurant and one food shop. Large supermarkets and a vast selection of excellent restaurants can be found in Imperia, a 15 minutes drive away. There are plenty of possibilities to pursue sports such as golf, tennis and watersports in the neighbourhood and Imperia and other costal resorts have sporting ports accommodating yachts of all shapes and sizes. The nearest skiing resort is just 40 km away. Accessibility to Imperia with its two motorway exits and two railway stations is excellent. The international airports in Nice and Genoa can be reached within the hour.